In Broken Sword 3: The Sleeping Dragon, time is running out for the planet. Earth is coming apart, and two private investigators will uncover the secret cause of it. Have you ever wondered about the Voynich Manuscript? How about the Knights Templar? Did you know why Solomon's Temple is so important to Christians and Knights Templar both? Did you ever wonder why the ancient Egyptians might have built their pyramids? Or what made Excalibur so powerful? If you were ever curious about any of the above--or just wanted a good wine recommendation and the chance to solve some intriguing puzzles without once touching a gun this game is for you. I am not a gamer and, to be honest, this is the very first game I finished. I quite literally could not leave it alone--the story and the puzzles alike kept me glued to my keyboard and monitor. For in this game you as Niko and George travel to the Congo, Europe, England, Middle East, and back to England, encountering mythological characters from around the globe. In what other game out this season can you find a dragon and Anubis side-by-side? And, of course, the good guys never, ever touch a gun. Who needs bullets if you have smarts? But smarts you most definitely need. Puzzle after intriguing puzzle await you here. And you cannot skip the cut scenes in this game--this is not a cut and slash game where the object is to kill anything that moves; here the cut scenes hold clues you will need to save the world. In fact, saving the world is about the only thing this game has in common with the slash-and-burn games we have all seen so often. But then, after all, it IS a game. Having been a huge fan of the two previous Broken Sword games I eagerly anticipated the release of the third installment in this brilliant graphic adventure series. I struggled with the rating of this game, I wanted to give it the full 5 stars but unfortunately there are one or two minor niggles which do detract from the overall enjoyment factor. But let's focus on the positives first, and there are plenty. BS:TSD is a tale of epic adventure, exploration and intrigue. Our intrepid heroes, George Stobbart and Nico Collard are once again thrust into a world riddled with ancient conspiracies and secret codes as they attempt to unravel the truth about a mysterious earth energy known as dragon power. From the outset, George ends up getting stranded in the Congo after the plane he was in crashes, whilst Nico witnesses the murder of a man in a Parisian apartment block, until eventually their two stories intertwine and they learn that they are both investigating the same case. Graphically this game is beautiful. The backgrounds are lovingly crafted, colours are vibrant and vivid, lighting and shadow effects are spot on, character animation is second to none and the lip synching is superb. It is a fully realised 3D world and the attention to detail is incredible. The music is suitably moody and atmospheric and the voice acting (George is once again voiced by Rolf Saxon as in the previous two games) is of a very high quality. Movement of George and Nico is with the arrow keys and there are four action mapped keys corresponding to the icons on screen, i.e, look, use, etc. This new interface takes about five minutes to get used to and is simple enough. Of course, the integral part of any adventure game are it's puzzles and this is where the first criticism can be levelled. Whilst almost always fun and logical to figure out they are a bit on the easy side and seasoned adventurers will rarely have trouble progressing. Quite simply, there are'nt any that match the complexity found in the previous games and this is a slight disappointment. And there are crate puzzles too. Lots of them. Whilst initially enjoyable there are far too many of them and they do tend to disrupt the flow of the game. There are also action elements implemented into the gameplay. Frequently you will find yourself leaping across chasms, shimmying across ledges and climbing walls. Another new feature are the timed action events in which you are put in danger and must react quickly. This simply involves pressing the only key available at the time, and even if you do die the game restarts from the point where you made the fatal error so you don't need to load a saved game and lose any progress you may have made. Occasionally, stealth will have to be employed to evade guards and dogs. This sometimes leads to awkward, confusing camera angles in conjunction with the character's movement, although by and large the camera often conveys a wonderfully cinematic feel to the proceedings. Paris, Glastonbury, Prague and Egypt are just some of the locations you will visit and explore, among others, and you will meet and interact with an interesting cast of characters, gathering information and vital clues to assist you further. The dialogue between George and Nico is often humorous, at times touching and a narrative high point in the script. There are also references to people and events from the two previous games, so although BS:TSD can be played as a stand alone adventure it's best to play the other two games first or it might seem a little mystifying. Another slight disappointment is that the game is a bit on the short side and leaves you wanting more. This game will have been an instant classic, if it weren't for the mediocre ending. The story plot is engaging, although not particularly innovative. However, just like the Gabriel Knight series, you play as two different characters, who in most of the game are in different places investigating different stuff. There are some very repetitive puzzles, such as moving boxes to the right position so you can climb and advance to the next location. 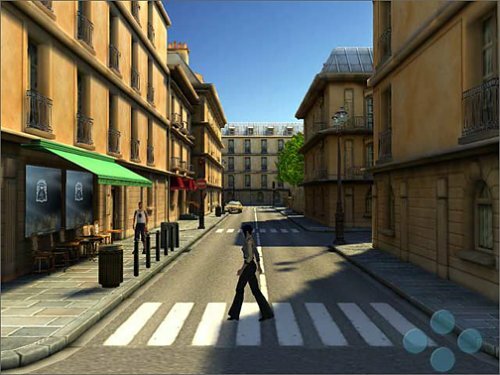 You get to go to many different locations, with many of them being in France, which is a plus for adventure games. Voice acting is decent. To be honest, I like the voice of George, but not Nico. The keyboard control reminds me of the Prince of Persia Series in the 90's. However, you don't have to worry about jumping all those cliffs and gaps without falling off. One thing good about this game is that once you are near the edge, you can choose the option "Jump", and the character will automatically jump across fine. Nevertheless, there are numerous times when you have to run away from a danger or do a certain action quickly, or else you die. For those who are into more traditional adventure games, this may not be very appealing. You'll be given chances to replay the sequence right before you die, but it can still get annoying if you couldn't get it right for many times. This game is a must for those who enjoyed the first two games in the Broken Sword series. George and Nico are back again for a very engrossing adventure. You will need to visit various locations around the world and solve puzzles to progress. Many of the puzzles involve using the right item at the right time. Some of the puzzles involve dragging crates around to form a staircase to get to a high up place. The first crate puzzle was totally confusing, so I referred to an online guide that talked about general strategies. After that I did quite well with them. The dialogue and possible actions have been highly restricted. If you do something 'wrong' or irrelevant you will get one of three various non-committal answers which provide no help to what you did wrong. (e.g. 'It didn't work' 'No way am I doing that' ' That doesn't seem quite right.') I found this extremely annoying, and wish they had scripted more helpful answers. This game is in 3-D! The keyboard controls are a bit awkward sometimes, and this is frustrating because there are some puzzles where you have to run across the screen to hide from guards. I found this out of the tradition of adventure games and more like an action game. These parts were obviously frustrating to me. Yet they do not overpower the game and don't occur very often. During one part of the game, for example, I thought I wasn't doing 'good enough' in running past one of the guards. In consulting the hints though I found that I didn't even need to be confronting that guard at that point in the game. Not to discourage adventure game makers, since there are so few these days, I must say that this game is not the goal to aim for. While it is a good game, an enjoyable game in many respects, it represents a lone voice in a current adventure vacuum. After playing it from start to finish within 5 days, I have to say several things; it is very easy, in terms of logic challenges. Ever heard of the old slip a newspaper under a door and poke out the key from the inside lock and gain access puzzle? This is that kind of game. This is the kind of game that gives you a small area to explore, and all the answers are right there, and the challenge is minimal. Also there are action-based challenges, which are fine, but sort of transform the game into a reflexive rather than cerebral arena. This game also owes a major debt to Gabriel Knight 3, which is a superior game. There are too many similarities in detail to be mistaken, but the major difference is that Gabriel Knight was written exceptionally well, and Broken Sword is merely adequate. The BS story takes you along to the next little episode, but doesn't quite bring all the parts together. When the final confrontion comes about, I was reminded of Asmodeus from GK3, until the action was over and the story was resolved. In the case of George and Nico, it didn't really come to anything, so I'm holding out for Broken Sword 4. I admit, I'll play it, since there are so few choices these days. But I have to say, I care so much more about Gabriel and Grace, and the ending of GK3 left me feeling more for two fictional characters than any movie or other game ever has. Sorry, George and Nico are lightweights. They don't have depth, and the series has never made the leap of genius, but they are fun for the short time that the game requires mastery of. I was a long time fan of the first two Broken Sword games and eagerly anticipated the release of number 3. I was a little worried at first with the move to 3D, concerned that it would turn into just another 'Tomb Raider' style game, where nimbleness of fingers was more important than dexterity of brain. Thankfully, this was not the case. The puzzles start of absurdly easy, which was a bit of a worry, but thankfully became more challenging as the game went on. The story is intriguing (even if you are not particularly interested in the Knights Templar, it is a great murder-mystery), the graphics are beautiful and the characters are given voice by real actors.